The CMCP602LST Series Accelerometer Extension Cables are designed for use with piezoelectric accelerometers featuring a 2 Pin Mil Spec MS 5015 connector (standard 2 pin connector). The CMCP602LST Series cables utilize a low noise cable with an overall braided copper shield to maximize the signal quality of the sensor. The overall black TPE jacket provides excellent chemical and sunlight protection while also providing the flexibility required to extend the life of the cable assembly. Each cable assembly is fitted with a 2 Socket MS 5015 connector that is fully encapsulated with epoxy to ensure water resistance. 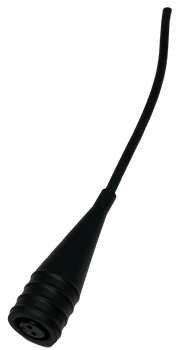 The CMCP602LST cable assemblies are available in both Isolated (for grounding at instrument end) and Non-Isolated (for grounded at the sensor end) versions. The North American standard is Isolated. .